Thanksgiving Dinner Menu ideas and recipes to help you plan ahead and have the best holiday with the least amount of stress! Clean out your fridge and freezer – this is one of the most important things you can do! Toss that old stuff, like LAST YEAR’S Thanksgiving leftovers and make room for new! Anything that you don’t know what it is TOSS IT! Clean out the pantry and spice rack – your recipes will taste so much better with fresh spices, so anything that’s more than a year old NEEDS TO GO! I know they’re expensive, but it does you no good to keep expensive spices on the rack if the flavor is dead. Make your list and do your grocery shopping way ahead of time. **Pro Tip: Be sure you have enough containers to store and freeze recipes ahead of time and for leftovers from your Thanksgiving dinner menu. I could not do without these handy restaurant-style quart-size containers and these tins are so perfect for leftovers. I use both of these products all year long to send leftovers home with people or to take food to someone. Order them now and you’ll have them in time! This page has a ton of information, so here’s an easy Table of Contents to help you navigate or you can just scroll down. You’re not going to find a lot of appetizers at a Southern Thanksgiving dinner. There is so much food that no one wants their guests to start eating and fill up on snacks before the big event! But for those who do want to add appetizers to your Thanksgiving dinner menu, we’ve got you covered! Homemade Pimento Cheese – my go-to appetizer for pretty much any occasion. Southern Cheese Straws – these are perfect for a light little snack with a glass of wine AND they can be made weeks in advance and frozen! Caramelized Bacon – take this bacon to a friend’s house and I guarantee you’ll be the star of the show! Stick with recipes that can be made ahead of time. Keep the appetizers light since Thanksgiving dinner is typically such a heavy meal. It’s all about the turkey, right? 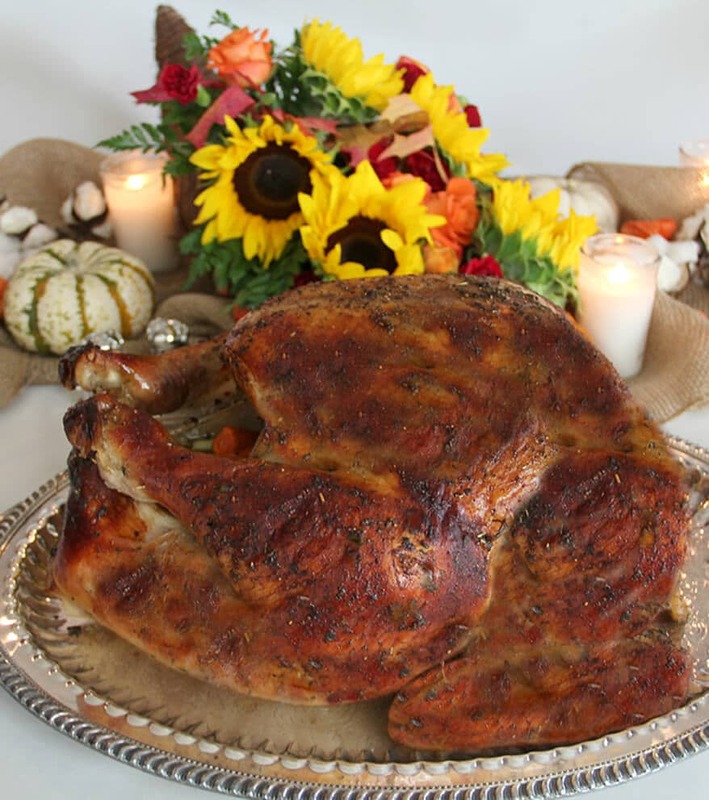 Here are my favorite turkey recipes, along with roasting and brining instructions. How to Roast a Perfect Turkey – step-by-step instructions to help you make the best roast turkey. **Pro Tip: You’ll need a large roasting pan with a rack. This one from Cuisinart is reasonably priced and is a nice size. The Turkey Brine – I always wet-brine my turkey and it turns out perfect every time! **Pro Tip: For this brine recipe, you need a large stockpot and space in the refrigerator. I have even used a clean 5-gallon bucket before! Herb Butter for Turkey – this is the secret sauce to roasting the best turkey. Full of fresh herbs and spices, this butter makes your turkey crisp and bursting with flavor! Turkey Breast Roasted with Maple Cayenne Glaze – if you have a smaller crowd, try this turkey breast recipe. It’s perfect and you’ll still have some leftovers for sandwiches! Have a reliable meat thermometer so you don’t overcook the turkey. There’s nothing worse than dry, stringy, overcooked turkey. For my family, Thanksgiving would never be complete without having a baked ham on the table. We always have turkey and ham on our Thanksgiving dinner menu! Baked Ham with Bourbon-Orange Sauce – this is a typical, honey-baked type of ham recipe that everyone absolutely loves! Cherry and Pomegranate Glazed Ham – if you want to try something a little different, this baked ham recipe is out of this world delicious! The only time of the year when you can indulge every carb craving and dessert craving you have all in one sitting! Here are our family’s favorite Thanksgiving sides recipes. Everyone has a different favorite so we usually have a large menu! Southern Cornbread Dressing – my Granny used to make this dressing every year. Just crumble cornbread and leftover biscuits, mix with celery and onions, and lots of flavorful stock. It’s perfect year-round. Apple Sausage and Mushroom Stuffing – not Southern but delicious! This stuffing will be a hit, I promise! There’s chopped apple, mushrooms, sausage, and lots of other tasty vegetables cooked in a delicious, crusty bread stuffing. It’s an amazing addition to your Thanksgiving menu! Broccoli Casserole with Bacon – not your ordinary broccoli casserole, this one will elevate your Thanksgiving dinner menu to another level. Bacon. Crushed cheese crackers. I’m telling you, this is the best broccoli casserole ever. Creamy Mashed Potatoes – the secret to making the best mashed potatoes is lots of butter and cream. I use a potato ricer like this one and then put them in the stand mixer for just a few minutes until the potatoes are perfectly creamy. Macaroni and Cheese – there would be a revolt in my house if I didn’t serve this mac and cheese. It’s the creamiest and the cheesiest. This is old-fashioned comfort food. Southern Green Beans – another non-negotiable Southern Thanksgiving recipe. Any other time we can have garlic roasted green beans, but at Thanksgiving it has to be the real deal. Three Bean Salad – here’s a classic Southern Thanksgiving recipe. Tangy and easy, this Three Bean Salad is a nice, light addition to the Thanksgiving menu. Roasted Pearl Onions – an absolute favorite, my Roasted Pearl Onions are SO EASY! I use frozen pearl onions and there’s no chopping involved. Trust me, you will love this recipe! Sweet Potato Casserole – no traditional Thanksgiving menu would be complete without this special dish. My version has a streusel topping, but you could swap it out for the classic marshmallow topping. Classic Southern Collard Greens – I have to be honest, nobody in my immediate family will eat collard greens. I love them but I don’t cook them, so I’m sharing my friend Stacey’s recipe over at SouthernBite.com. Southern Style Turnip Greens – this is a classic, delicious recipe from Mary over at DeepSouthDish.com. Southern Deviled Eggs – can you even have Thanksgiving without deviled eggs? Can you have any gathering without deviled eggs? These are simple and classic, with just a little mayonnaise, touch of mustard, and pickle relish. Southern Style Potato Salad Recipe – I don’t have a potato salad recipe here yet, but this one from Southern Living is pretty close to how my family makes potato salad. Easy Kale Salad with Mango Chutney Dressing – there’s always someone who looks for something healthy, so I like to have a fresh salad as an option. This one is easy and tasty and even non-kale lovers will like it! Seriously, I have such a love for Brussels sprouts that my Thanksgiving Brussels Sprouts recipes has to have its own little section! And I didn’t even like Brussels sprouts growing up. Add one of these recipes to your Thanksgiving dinner menu and you might just convert someone in your family too! Caramelized Roasted Brussels Sprouts – this is my most common and easiest preparation. These caramelized Brussels sprouts bake in the oven and come out tasty and crispy! Maple and Balsamic Glazed Brussels Sprouts – yum! Crispy and slightly sweet to cut the bitterness, this is a lovely presentation of Brussels sprouts. Plan, plan, plan, especially if you only have one oven. Write down the temperature and cook time of every recipe so you can create a schedule for what can go in the oven at the same time, and the order everything needs to cook. Many Thanksgiving sides recipes can be made ahead and reheated on Thanksgiving Day. Some can even be frozen ahead of time! My favorite part of the day. My sweet tooth kicks in and no matter how much turkey and dressing I ate, I always have room for the Thanksgiving desserts. I like to fix a sampler plate with a little taste of everything! **Pro Tip: Here’s where you can really go crazy—we typically have several different desserts on our Thanksgiving dinner menu, including an assortment of cakes, pies, and cookies! Pumpkin Cream Cheese Roll – seriously the best pumpkin roll we’ve ever tasted. This is an old recipe from somebody’s grandma. Southern Pecan Pie – I use cane syrup in place of some of the corn syrup to give my pecan pie more depth of flavor. Mama’s Sweet Potato Pie – my Mama makes the best sweet potato pie on the planet. No need to run over to the big box store and buy one because you can easily make this one! Fudge Pie – my little grandson helps make this pie every year. It’s so easy and so yummy, it’s usually the first Thanksgiving dessert to disappear. Southern Caramel Cake – here’s a show-stopper for you. It’s not the easiest recipe to make but it’s worth the effort. Cream Cheese Pound Cake – this is an easy Thanksgiving dessert recipe that you can make several days ahead of time. It’s always moist and everyone loves it. Pumpkin Pie with Gingersnap Crust – step up your pumpkin pie with this crunchy gingersnap crust. The contrast with the sweet pumpkin pie filling is divine! Southern Banana Pudding – isn’t there just something about a classic banana pudding? This one has the best custard recipe from the famous Edna Lewis. It’s rich and absolutely the best banana pudding we’ve ever tried. Classic Double Crust Apple Pie – another must-have, this apple pie is a simple, traditional, and easy recipe. Apple Crisp without Oats – this one is so easy and every one loves it. I don’t like oats in my streusel topping, so this one has no oats and is nice and crispy. Southern Peach Cobbler – we don’t typically have peach cobbler at our family Thanksgiving, but around this time of year, this is one of the most popular recipes on this site so somebody must be serving peach cobbler! Best Chocolate Chip Cookies – kids and grownups love these chocolate chip cookies and they are ALWAYS on my Thanksgiving dinner menu. Most cakes can be made several days ahead of time. Layer cake layers can be frozen and then the cake put together and frosted a couple of days before the event. Pies can also be made a couple of days before the day you want to serve them. Fudge Pie, Pecan Pie, Pumpkin Pie, and Cream Cheese Pound Cake can all be made ahead and are easy to transport with no mess. Creamy Giblet Gravy – you must have gravy on your Thanksgiving dinner menu, and this one is extra special due to a little addition of cream. Fresh Cranberry Sauce – while we will always have the jellied cranberry from the can, I like to serve this fresh cranberry sauce as well. It’s tangy from a touch of horseradish, and sweet from the cranberries and sugar—a perfect accompaniment to the turkey and dressing. Peach Chutney – you cannot serve ham without this peach chutney. I promise. Try it and you’ll add it to your annual Thanksgiving dinner menu. So you cooked that big turkey and now you have a lot leftover…what should you do with it? You can’t go wrong with a simple turkey sandwich, of course. But when you’re ready to try something new, try my Leftover Turkey Hand Pies with Cranberry and Boursin. They are a treat! 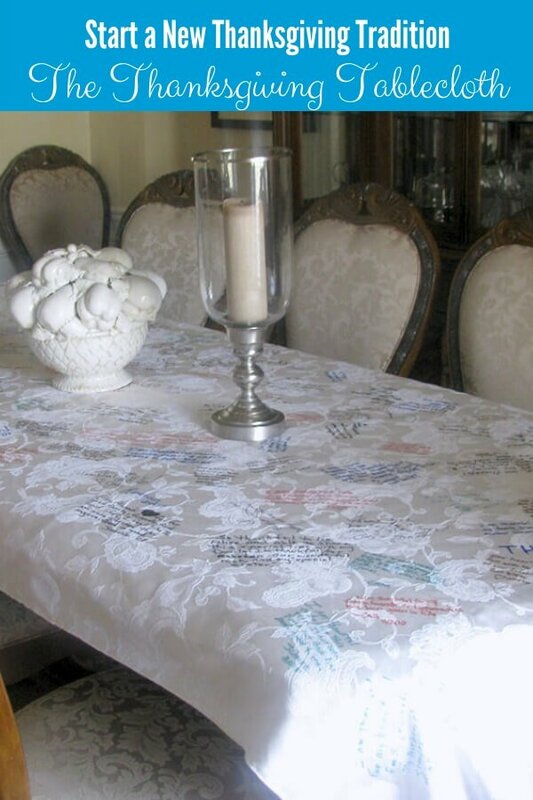 Be sure and check out my post on our Thanksgiving tablecloth—you may want to start this tradition in your family! What’s on your Thanksgiving dinner menu? Leave a comment below and share your ideas. Update Notes: This post was originally published November 3, 2011, and on November 12, 2018, was updated with one or more of the following: step-by-step photos, video, updated recipe, new tips. Wow, I would be very happy to eat at your house for Thanksgiving! What a great menu.